This article is about the IP network protocol only. For Internet architecture or other protocols, see Internet protocol suite. The Internet Protocol is responsible for addressing hosts and for routing datagrams (packets) from a source host to a destination host across one or more IP networks. For this purpose, the Internet Protocol defines the format of packets and provides an addressing system that has two functions: Identifying hosts and providing a logical location service. Each datagram has two components: a header and a payload. The IP header is tagged with the source IP address, the destination IP address, and other meta-data needed to route and deliver the datagram. The payload is the data that is transported. This method of nesting the data payload in a packet with a header is called encapsulation. IP addressing entails the assignment of IP addresses and associated parameters to host interfaces. The address space is divided into networks and subnetworks, involving the designation of network or routing prefixes. IP routing is performed by all hosts, as well as routers, whose main function is to transport packets across network boundaries. Routers communicate with one another via specially designed routing protocols, either interior gateway protocols or exterior gateway protocols, as needed for the topology of the network. IP routing is also common in local networks. For example, many Ethernet switches support IP multicast operations. These switches use IP addresses and Internet Group Management Protocol to control multicast routing but use MAC addresses for the actual routing. The versions currently relevant are IPv4 and IPv6. In May 1974, the Institute of Electrical and Electronic Engineers (IEEE) published a paper entitled "A Protocol for Packet Network Intercommunication". The paper's authors, Vint Cerf and Bob Kahn, described an internetworking protocol for sharing resources using packet switching among network nodes. A central control component of this model was the "Transmission Control Program" that incorporated both connection-oriented links and datagram services between hosts. The monolithic Transmission Control Program was later divided into a modular architecture consisting of the Transmission Control Protocol and User Datagram Protocol at the transport layer and the Internet Protocol at the network layer. The model became known as the Department of Defense (DoD) Internet Model and Internet protocol suite, and informally as TCP/IP. Version 5 was used by the Internet Stream Protocol, an experimental streaming protocol. The successor to IPv4 is IPv6. Its most prominent difference from version 4 is the size of the addresses. While IPv4 uses 32 bits for addressing, yielding c. 4.3 billion (7009430000000000000♠4.3×109) addresses, IPv6 uses 128-bit addresses providing ca. 340 undecillion, or 7038340000000000000♠3.4×1038 addresses. Although adoption of IPv6 has been slow, as of June 2008, all United States government systems have demonstrated basic infrastructure support for IPv6. IPv6 was a result of several years of experimentation and dialog during which various protocol models were proposed, such as TP/IX (RFC 1475), PIP (RFC 1621) and TUBA (TCP and UDP with Bigger Addresses, RFC 1347). The assignment of the new protocol as IPv6 was uncertain until due diligence revealed that IPv6 had not yet been used previously. Other protocol proposals named IPv9 and IPv8 briefly surfaced, but had no affiliation with any international standards body, and have had no support. On April 1, 1994, the IETF published an April Fool's Day joke about IPv9. The design of the Internet protocols is based on the end-to-end principle. The network infrastructure is considered inherently unreliable at any single network element or transmission medium and is dynamic in terms of availability of links and nodes. No central monitoring or performance measurement facility exists that tracks or maintains the state of the network. For the benefit of reducing network complexity, the intelligence in the network is purposely located in the end nodes. As a consequence of this design, the Internet Protocol only provides best-effort delivery and its service is characterized as unreliable. In network architectural language, it is a connectionless protocol, in contrast to connection-oriented communication. Various error conditions may occur, such as data corruption, packet loss, duplication and out-of-order delivery. Because routing is dynamic, meaning every packet is treated independently, and because the network maintains no state based on the path of prior packets, different packets may be routed to the same destination via different paths, resulting in out-of-order sequencing at the receiver. IPv4 provides safeguards to ensure that the IP packet header is error-free. A routing node calculates a checksum for a packet. If the checksum is bad, the routing node discards the packet. Although the Internet Control Message Protocol (ICMP) allows such notification, the routing node is not required to notify either end node of these errors. By contrast, in order to increase performance, and since current link layer technology is assumed to provide sufficient error detection, the IPv6 header has no checksum to protect it. All error conditions in the network must be detected and compensated by the end nodes of a transmission. The upper layer protocols of the internet protocol suite are responsible for resolving reliability issues. For example, a host may buffer network data to ensure correct ordering before the data is delivered to an application. The dynamic nature of the Internet and the diversity of its components provide no guarantee that any particular path is actually capable of, or suitable for, performing the data transmission requested, even if the path is available and reliable. One of the technical constraints is the size of data packets allowed on a given link. An application must assure that it uses proper transmission characteristics. Some of this responsibility lies also in the upper layer protocols. Facilities exist to examine the maximum transmission unit (MTU) size of the local link and Path MTU Discovery can be used for the entire projected path to the destination. The IPv4 internetworking layer has the capability to automatically fragment the original datagram into smaller units for transmission. In this case, IP provides re-ordering of fragments delivered out of order. The Transmission Control Protocol (TCP) is an example of a protocol that adjusts its segment size to be smaller than the MTU. 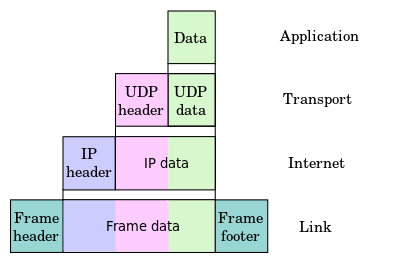 The User Datagram Protocol (UDP) and the Internet Control Message Protocol (ICMP) disregard MTU size, thereby forcing IP to fragment oversized datagrams. An IPv6 network does not perform fragmentation or reassembly, and as per the end-to-end principle, requires end stations and higher-layer protocols to avoid exceeding the network's MTU. During the design phase of the ARPANET and the early Internet, the security aspects and needs of a public, international network could not be adequately anticipated. Consequently, many Internet protocols exhibited vulnerabilities highlighted by network attacks and later security assessments. In 2008, a thorough security assessment and proposed mitigation of problems was published. The Internet Engineering Task Force (IETF) has been pursuing further studies. ↑ Mulligan, Geoff. "It was almost IPv7". O'Reilly. O'Reilly Media. Retrieved 4 July 2015. ↑ Leyden, John (6 July 2004). "China disowns IPv9 hype". theregister.co.uk. The Register. Retrieved 4 May 2014. ↑ Parker, Don (2 November 2010). "Basic Journey of a Packet". symantec.com. Symantec. Retrieved 4 May 2014. ↑ Bill Cerveny (2011-07-25). "IPv6 Fragmentation". Arbor Networks. Retrieved 2016-09-10.